"Power corrupts; absolute power corrupts absolutely". Last week blows because I couldn't practice anything. All because of these in power! Today, I'm getting back on track which feels really gooood! R4 advertises loopbacks as per Task 1 in lab 108. Changes in the lab "equipment". Pay attention to port numbers in the topology. Configure R4 so that it advertises prefix 40.1.0.0/16 with 'no-advertise' value. 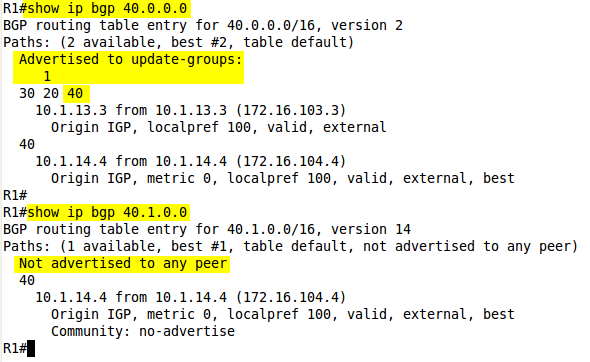 Configure R1 and R2 so that they aggregate prefixes 40.x.x.x/16 and 44.4.0.0/19 to two prefixes 40.0.0./14 and 44.4.0.0/17 (as per lab 111). Make sure that R5 receives the two summary routes and they show AS 40 in the path. Do NOT remove the community 'no-advertise' assigned in the task 1. Pic. 2 - Prefixes Detail on R1. The community 'no-advertise' prevents R1 and R2 from advertising it out to R3. Other prefixes (here one example: 40.0.0.0) get advertised. The prefix 40.1.0.0/16 has been marked with 'no-advertise' community. R1 and R2 CANNOT advertise it. Since the 'as-set' option allows a mixture of attributes to be advertised (R5 is supposed to receive AS 40 in the path of the summarized routes) this community prevents them from sending 40.0.0.0/14 out to R3 (look at the lab 112). Task 2 stipulates that this community should not be removed (could be done with the 'attribute-map' option of the aggregate-address command), but the aggregate should be advertised nevertheless. The solution is to use the 'advertise-map' keyword while doing aggregation. This keyword references the route-map which decides which prefixes are going to be considered as the candidates for summarization. Here, I deny 40.1.0.0/16 from being summarized and allowing all the rest to be included in the summary route. As a result of that the community 'no-advertise' will NOT be factored in. This way, R5 receives both aggregates and they DO show AS 40 in the path. Pic. 3 - BGP Table on R5. R4 advertises loopbacks as per Task 1 in lab 108. 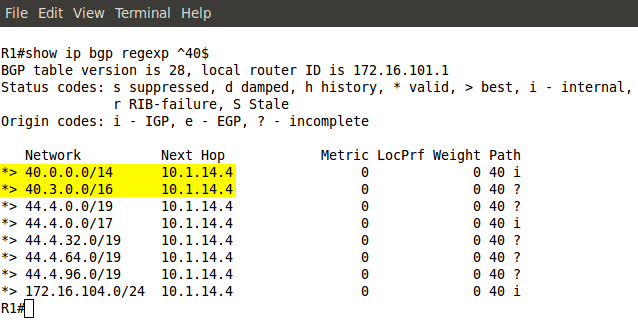 Configure R4 in such a way that R1 and R2 do not advertise the prefix: 40.1.0.0/16 to any of the BGP routers. R1 and R2 should receive all the prefixes from R4. 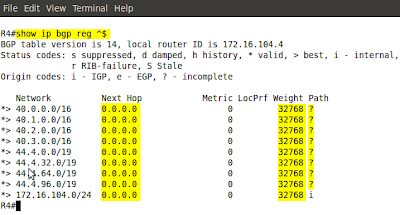 Configure R1 and R2 so that they aggregate prefixes 40.x.x.x/16 and 44.4.0.0/19 to two prefixes 40.0.0./14 and 44.4.0.0/17 (as per lab 111). Make sure that R5 receives the two summary routes and they show AS 40 in the path. Pic. 3 - Prefix 40.1.0.0 Details on R1. The prefix 40.1.0.0/16 is marked with the community NO_ADVERTISE and as such, will not be advertised to any peer (R3 here). Pic. 4 - BGP Table on R5. R5 does not receive 40.1.0.0/16 because neither R1 nor R2 send it towards R3. 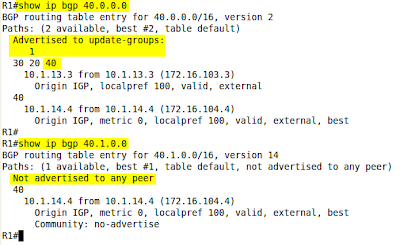 Configure R1 and R2 so that they aggregate prefixes 40.x.x.x/16 and 44.4.0.0/19 to two prefixes (as per lab 111). Make sure that R5 receives the two summary routes and they show AS 40 in the path. Pic. 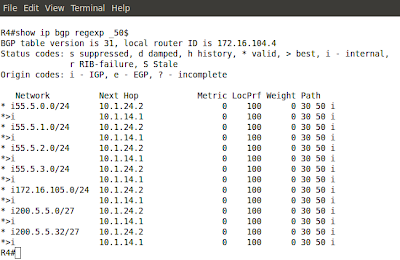 5 - BGP Table on R5. The solution is to remove NO_ADVERTISE community on R1 and R2 but leaving the 'AS-SET' attribute so R3 and R5 receive all AS numbers before the routes were aggregated (keep in mind that AS numbers before aggregation are listed but not necessarily in the right order since this is only a loop prevention mechanism). Pic. 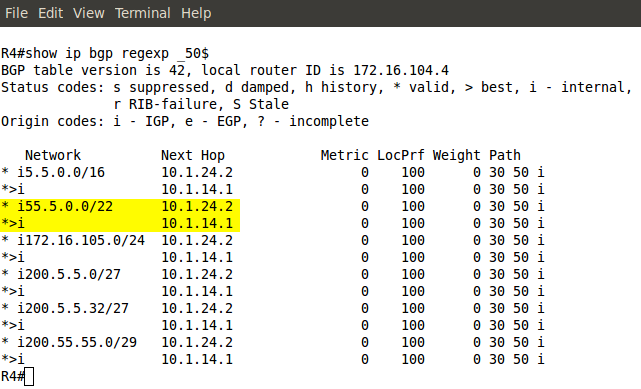 6 - BGP Table on R3. Pic. 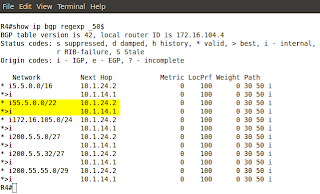 7 - BGP Table on R5. Thing to remember: the 'attribute-map' sets or removes attributes to the aggregated prefixes which use 'as-set' keyword. Three day trip to Galway (Sun-Tue). Nice distraction but I'm tired like hell today. Fell deeply in love with the town. It must be these 17 thousands young students on the streets. The fountain of Youth! 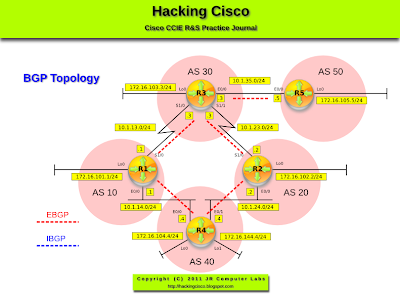 R4 loopbacks as per Lab 108. 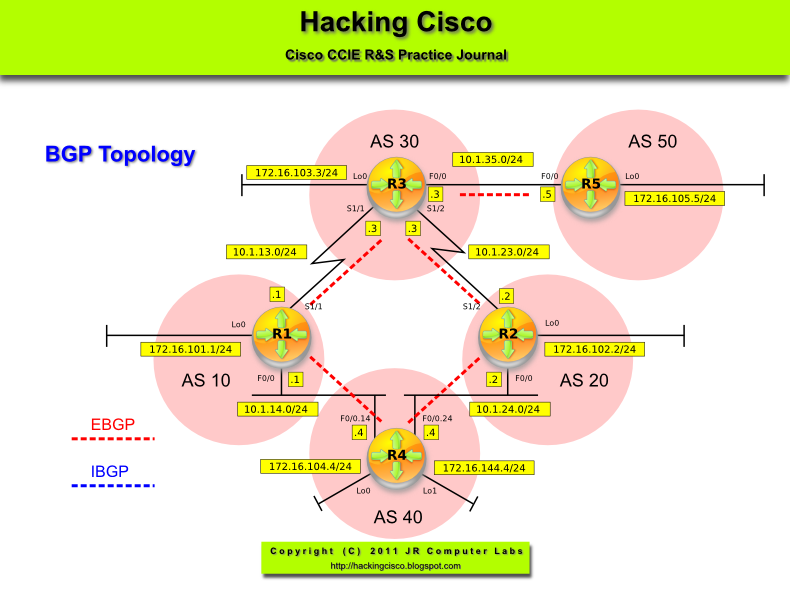 Configure R4 to advertise loopbacks to 40.x.x.x/16 and 44.4.x.x/19 into BGP. Do not use the network statement. Make sure the prefixes are advertised with the IGP origin code ('i'). Configure R1 and R2 aggregation for the prefixes advertised on R4 (in Task 1). Make sure that R5 can see the all AS numbers to reach these two aggregates. Pic. 2 - BGP Prefixes Originated by R4. 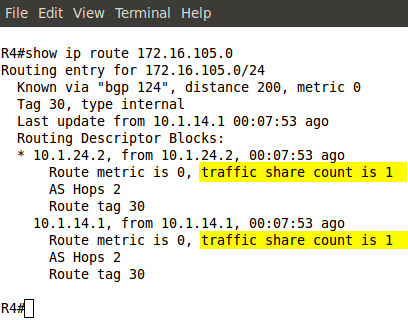 R1 and R2 being aggregating routers remove AS 40 before they advertise the the summary routes. They set two attributes: aggregator and atomic-aggregate. Below picture shows the aggregate route WITHOUT the 'as-set' option. Pic. 4 - R5's Aggregate without 'AS-SET'. The result is loosing the AS 40 in the path. R5 knows that some information has been lost. Pic. 5 - R5's Aggregate with 'AS-SET'. The 'atomic-aggregate' no longer shows. AS 40 is prepended to aggregate. Pic. 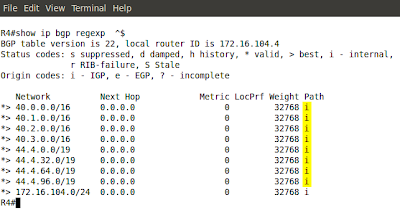 6 - BGP Table on R5. Remember that losing information about AS number can cause loops. 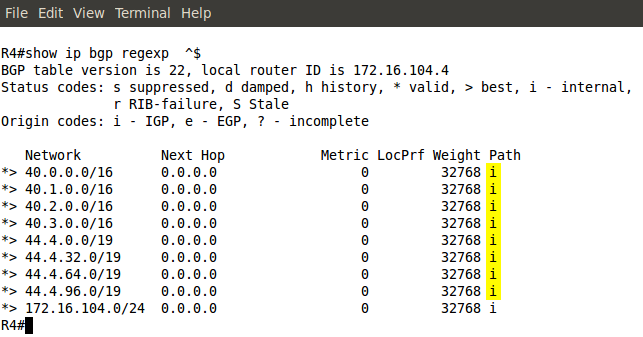 BGP routers reject prefixes if their own AS shows in the path. 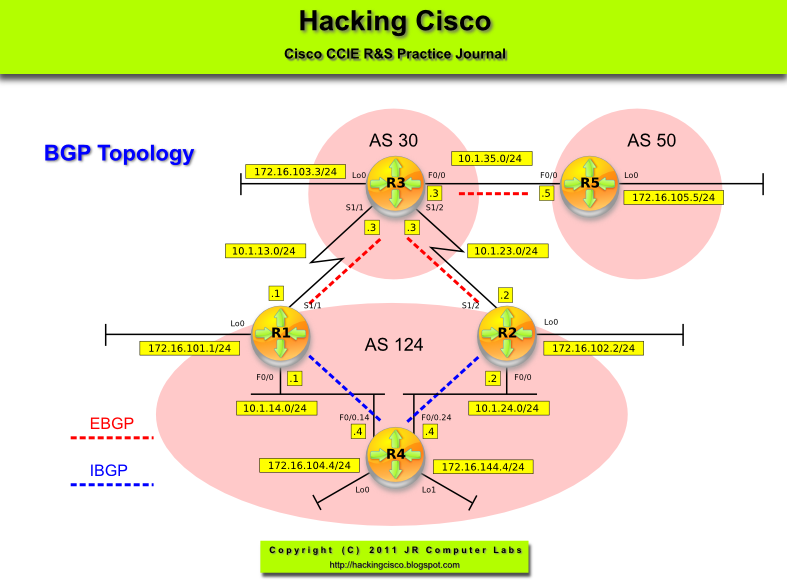 BGP configuration based on Lab 108 (R4 loopbacks already advertised and aggregated). As per lab 108 R4 aggregates 40.4.x.x/19 range of prefixes to 40.4.0.0/17 but allows more specific ones to be advertised too. Configure R4 to advertise only the aggregate route 44.4.0.0/17. On R4 advertise 44.4.64.0/19 in addition to the aggregate prefix 44.4.0.0/17. Pic. 2 - 44.4.x.x Prefixes on R4. All 44.4.x.x/19 are being suppressed and only 44.4.0.0/17 is going to be advertised now. Pic. 3 - AS 40 Originated Prefixes in R5's BGP Table. Pic. 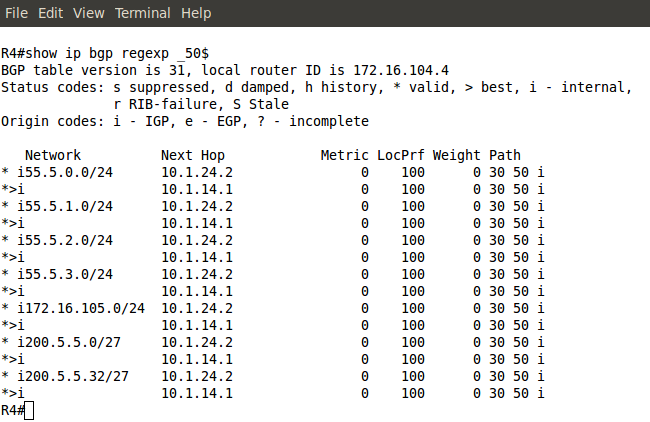 4 - AS 40 Originated Prefixesin R5's BGP Table. Permit statement in prefix-list PFX_SUPPRESSED used by the route-map SUPPRESS filters out more specific routes. What is NOT permitted in the prefix-list will NOT be suppressed by the 'summary-only' option. Pic. 2 - Suppressed Routes on R4. 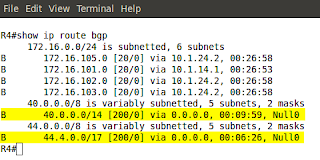 Applying this change does not require 'clear ip bgp * out' but it takes a moment to unsuppress the prefixes. from the Neighbor AS 40. R1 receives the aggregate route 40.0.0./14 as well as unsuppressed route 40.3.0.0/16. R2 receives the aggregate route 40.0.0./14 as well as unsuppressed route 40.1.0.0/16. 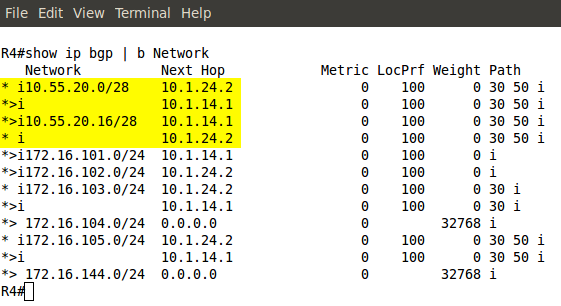 On R4 the following loopbacks should be advertised into BGP. Do not use network statement. Summarize all prefixes 40.x.x.x to one prefix only. Summarize prefixes 44.x.x.x but make sure that more specific prefixes are also advertised. Use BGP aggregation command to accomplish this. Pic. 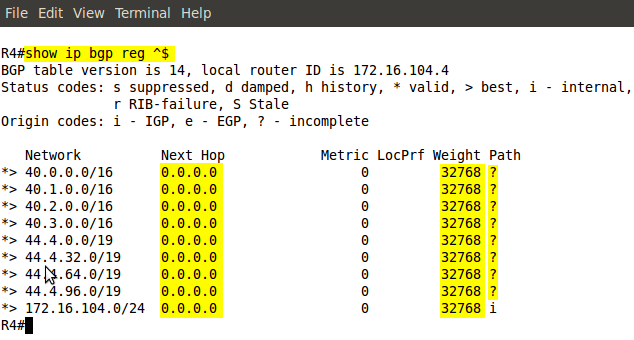 2 - BGP Prefixes Originated locally on R4. Pic. 3 - BGP Table on R4. R4 suppresses 's' more specific routes if 'summary-only' command is used. Only 40.0.0.0/14 is going to be advertised. 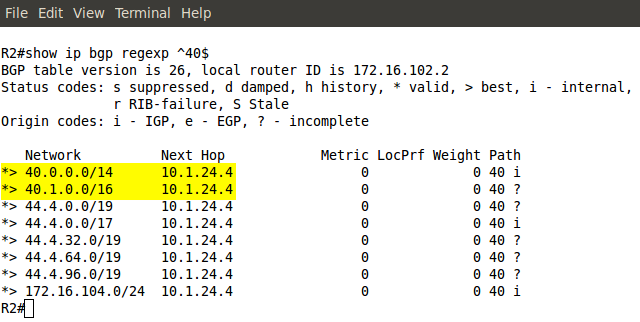 If 'summary-only' command is NOT used, the router creates the aggregate route and advertises it with addition to more specific routes. Pic. 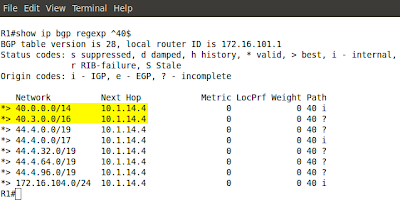 4 - Routing Table on R4. Similarly to other routing protocols the entry to 'null0' is created for the summary route as a loop prevention mechanism. Pic. 5 - AS 40 Prefixes Learned on R5 . All prefixes 44.x.x.x AND the summary route are propageted. The prefix 40.x.x.x is the only summary route since 'summary-only' keyword has been used. Configure R5 so that it advertises one summary route representing the below prefixes (loopbacks on R5). Make sure the summary route does not overlap any other addresses. Do not use 'aggregate-address' command. Pic. 2 - BGP Table on R4. 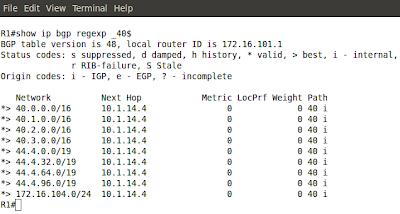 BGP cannot advertise prefixes that do not have EXACT match in the routing table. 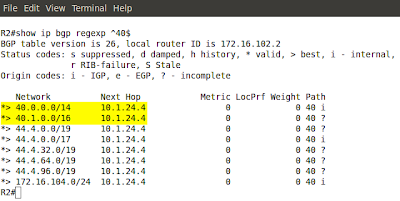 The 'ip route null0' can be used to summarize the prefixes. Only local prefixes can be advertised this way. 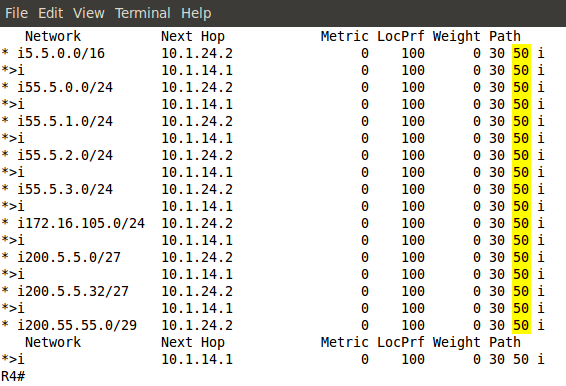 Advertise all those addresses into BGP. On R4 check what prefixes are originated by AS 50. Use prefix-list to accomplish this. I'm physically exhausted today. If you can't run, try to walk. One post must do today. On R5 add the following loopbacks and advertise them into BGP. On R4 use an extended ACL to filter out all prefixes with an odd third octet using /28 or longer network mask. Pic. 2 - R4 Receives New Subnets. Even though extended ACLs are not easy to accomplish complex matches it is possible to use them this way. The destination address/wildcard pair match on the prefix length (highlighted portion of the ACL). 10.55.55.0/24 and 10.55.55.16/24 have been filtered out because their third octet are odd numbers AND their network mask length is /28. Back home! 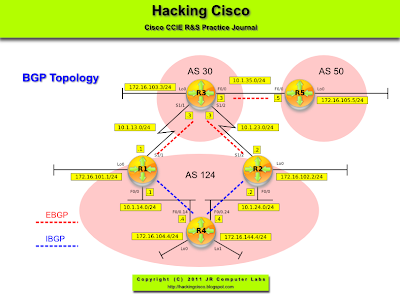 Resuming my bgp command study and posts. My company seem to have planned a lot of travels for me (well, beggars can't be choosers). These kind of study distractions I equate to a tcp slow start: they're inevitable impediments and must be factored in during study. On R5 filter out all prefixes with even numbers on the third octet. 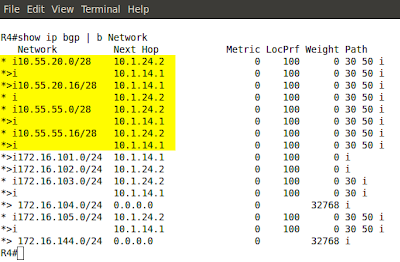 172.16.102.0/24, 172.16.104.0/24 and 172.16.144.0/24 are no longer in the BGP table on R5. 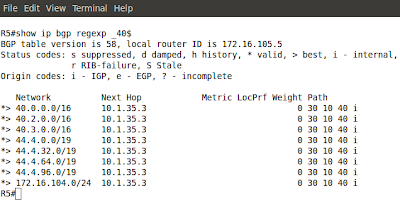 The 'clear ip bgp * in' is required for this filter to take effect. Given the topology (pic. 1), configure AS 50 so it does not accept prefixes from AS 124. Do not use any access-list, prefix-list, as-path access-list to accomplish this. Configuration allows the maximum as-path length of 1 AS. 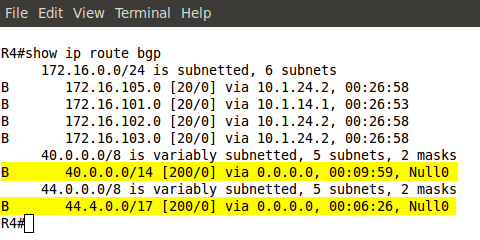 Assuming the Serial connections to R3 is 512 kbps, configure BGP on routers so that R4 does an equal load balance towards 172.16.105.0/24. prefixes must have the same attributes: Weight, Local Preference, Origin, MED. prefixes must be learned either through IBGP or EBGP sessions. If you want to achieve unequal cost load balancing, the bandwidth parameter must be properly configured (ratio). Pic. 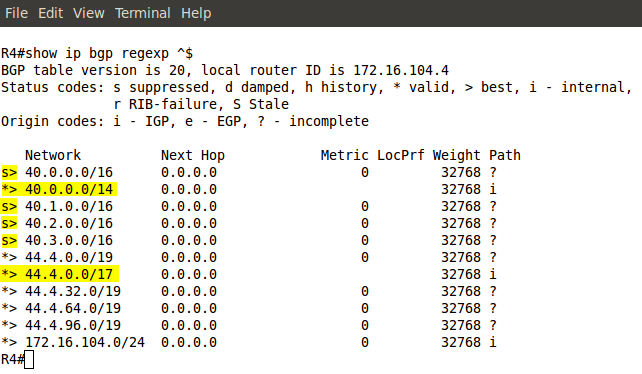 2 - BGP Table on R4 Before Applying Configuration. Pic. 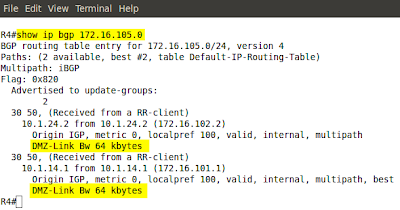 3 - Routing Table on R4 Before Applying Configuration. Only one path is installed in the routing table. Pic. 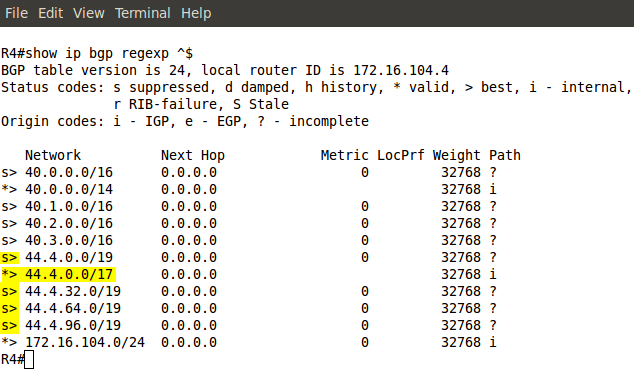 4 - BGP Prefix Details on R4. Pic. 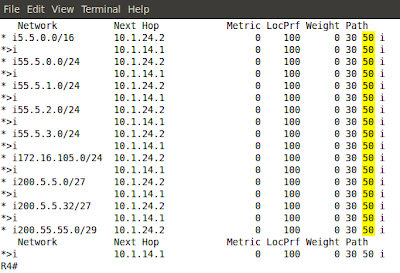 5 - Routing Table on R4. 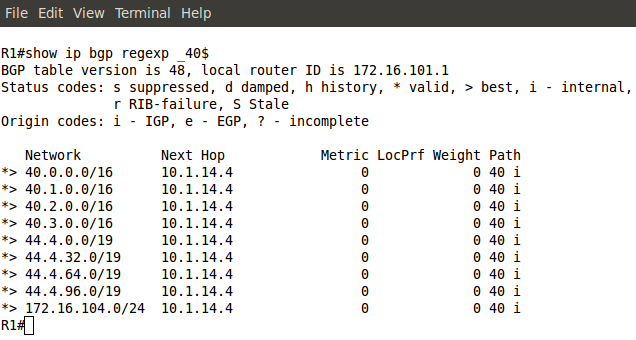 Only one path shows as best in the BGP table. However, both are installed in the routing table. Pic. 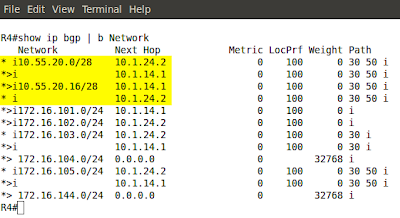 6 - Prefix Details in the Routing Table.